You are here: Home / Eating Fresh / Breakfast / Blueberries for Breakfast! Ah, summer…although it’s officially not summer yet, it may feel like it. We’ve got all the essentials–kids almost out of school, the pool’s open and it’s definitely hot enough to fry an egg on the sidewalk (at least in Texas!) And let’s not forget all the summer fruit arriving at your local market: strawberries, blueberries, cherries and melon (to name a few) are yours for the tasting. Adding the bounties of summer to your table also do some favors for your health. Summer fruits are packed with vitamin C, potassium, fiber and water. Potassium is good for your blood pressure, vitamin C is good for your immune system and we all need fiber and water to help the digetive system do it’s thing. I must mention all the antioxidants in your summer fruit that you could never get by taking a vitamin supplement! Which brings me to one of my favorite summer fruits, blueberries. That bluish color that we love so much (except when it’s on your white shirt) is provided by an antioxidant called anthocyanidin. Anthocyanidins neutralize free radicals that can lead to cataracts, glaucoma, heart disease, cancer and much more. (If you are a mom-to-be or dad or momma-wanna-be, antioxidants from berries can help you get pregnant and stay pregnant!) Blueberries even contain 38% more of that antioxidant than red wine! 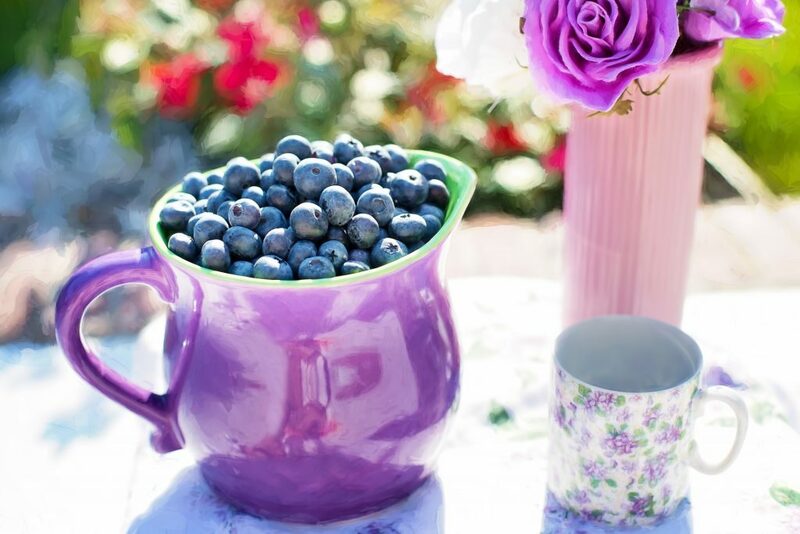 Just imagine how healthy we’d all be if we had a cup of blueberries every night with dinner! Blueberries are also brain food–animals studies show they decrease oxidative stress in the brain, which could lead to Alzheimer’s. I just had a cup of them on top of my cereal, which inspired me to inspire you to eat them too! 1. In your cereal. What could be easier? (My personal fav is Kashi Go Lean Crunch mixed with Cheerios) If you like your cereal hot in the summer, blueberries are great thrown in at the last minute of cooking. They burst and then you’ve got blue oatmeal. Yum! Also perfect if you like your oatmeal uncooked, as in Overnight Blueberry Pie Oatmeal! 2. Over a whole grain waffle. What I like to do is spread the waffle with natural peanut butter and then stick the blueberries in the holes. The berries stick to the peanut butter and you can pick it up with your hands. Fun for kids! 3. On your bagel. 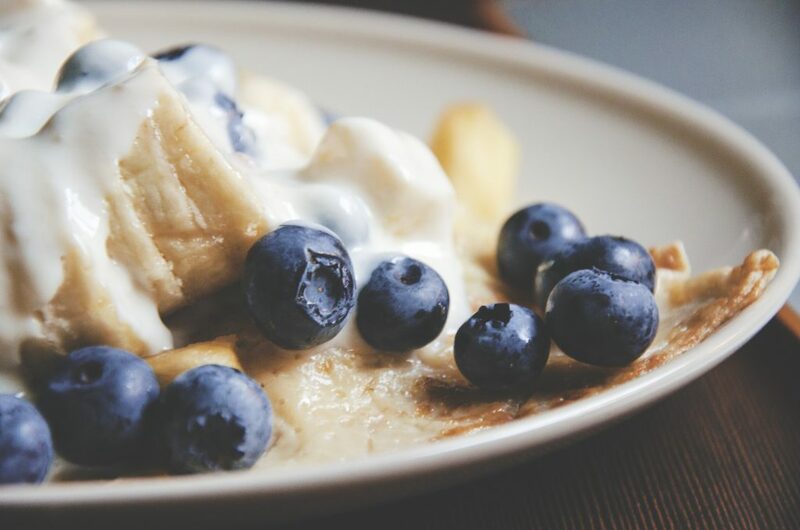 Spread some low-fat or fat-free cream cheese on that small, whole grain bagel and again stick the blueberries on. Make a smiley face to start your day on the right foot! 4. As a crisp or in a quick bread. OK so it sounds more like dessert, right? You can make a low sugar blueberry crisp with oatmeal and eat it for breakfast. Seconds anyone? Don’t forget the milk! 5. In your pancakes–or crepes. I know what you’re thinking–this dietitian likes sweets! Well, true, but here I’m advocating for a healthier pancake. There are plenty of whole pancake mixes (From Bob’s Red Mill Organic to 365 EveryDay Organic) on the market or make your own. There’s a great recipe here at Sally’s Baking Addiction. Mix in blueberries in the whole batch, or just poke them on top of the pancakes while they are cooking. Crepes are thinner so you can eat more of them with fewer carbs and fill them to overflowing with berries and Greek yogurt. 6. In a race. Those with teenagers at home will like this one. See how many you can throw in the air and catch with your mouth. If you have a toddler at home, you can see who eats more–the baby or the dog waiting for the baby to throw them over the high chair! 7. In a green smoothie. Berries are the perfect way to mask the taste of kale or spinach in your smoothie! Nothing hides the taste of kale and spinach better than a mixture of berries, pineapple and banana. 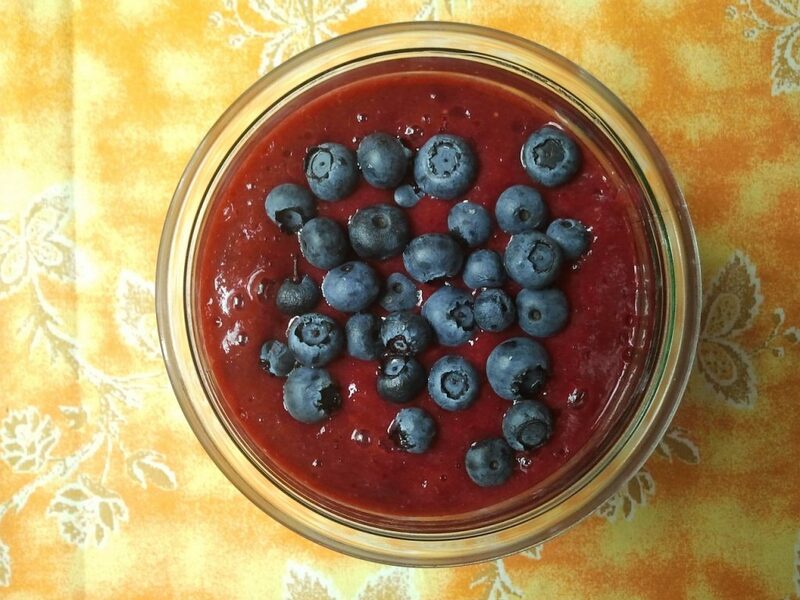 Keep blueberries in your freezer for a quick and always available addition to your blender breakfast. See you at Sam’s–where I buy 2 quarts of blueberries a week! Enjoy!